SHAZAM! Another super hero movie? Do we really need one? The answer, in this case, is a resounding YES! The DC Universe got this one right. 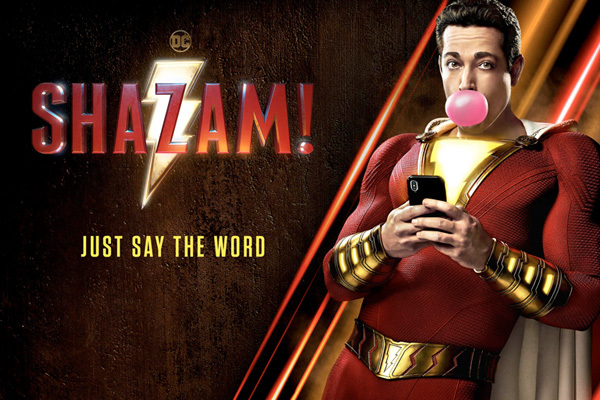 “Shazam,” starring Zachary Levi, Jack Dylan Grazer, and Asher Angel, is written by Henry Gayden and directed by David F. Sandberg and this team creates an immediately engaging, funny, sweet, and sometimes scary story about life as we enter a world where good and evil fight hand to hand or sometimes lightning bolt to lightning bolt combat. “Shazam!” is exactly what a super hero movie is supposed to be—fun and complete entertaining escapism. The story is loosely based on the original comic book series by C.C. Beck and all you comic book aficionados will have great joy in identifying the Easter eggs sprinkled throughout the film, but for those of us who are clueless about the genre, Gayden more than adequately lays the foundation for the story of Billy Batson (Angel) aka Shazam (Levi). We begin in 1974, winter in Upstate New York, where a father and his two sons are driving the country snow-filled back roads to grandfather’s house when Thad, Magic 8 Ball in hand, is suddenly in the presence of The Wizard (Djimon Hounsou) who is searching for a pure soul to take his place in protecting the world from the 7 evils locked away in stone surrounding him. Failing the test, Thad is shot back into reality and a nearly tragic accident. It’s a jarring beginning to a film, but it lays a firm foundation and by no means is the overall tone for the film. Fast forward to the turn of the century and we meet the young Billy who is separated from his mother. In a loss at finding her, Billy is placed in foster homes, one after another. He’s a delinquent constantly in search of his mother, hoping she has been doing the same. Placed in yet another foster home filled with an eclectic mix of kids, Billy makes no attempt to fit in, but he finds himself in front of The Wizard, reluctantly accepting his powers and this is where the fun begins as this 14 year-old transforms back and forth into a man with incredible powers, but still has the mentality of a boy. Billy befriends his disabled foster brother who is a geeky expert on all things super hero. Together they test Billy’s new-found powers as his discovery of his new self lands him in hilarious situations, preparing him for his ultimate and yet unknown nemesis. “Shazam!” takes us all back in time to our youth reminding us of how bullies wreak havoc and the social awkwardness of being a kid. Additionally, it creates a loving tone accentuating the importance of family and what that really means. Angel and Grazer are magical together on screen typifying two polar opposites, but both with bold personalities that immediately connect you. Angel creates a hardened exterior with a heart of gold and we watch this young boy grow. He’s funny and energetic with an innocence of childhood yet this broken heart of his casts a shadow on his every move. This young actor has a bright future ahead of him proving that he can already find a way to create depth in what could have been a very superficial performance. Grazer equals Angel’s performance, embodying a boy with more hurdles to jump over than most of us can imagine. His quick wit and style of speech brings a sense of compassion and understanding to his character as you forget about his disability…something his character can never do. While Angel and Glazer shine, it’s Levi’s ingenious efforts that are truly striking as he makes us believe he’s actually a 14 year old kid beneath that chiseled adult exterior. The genius doesn’t stop there as he is a gifted comedian, having fun and highlighting his timing and physically comedic attributes. In fact, the entire cast of kids in the foster home, Mary (Grace Fulton), Eugene (Ian Chen), Pedro (Jovan Armand) and Darla (Faithe Herman) are simply marvelous, but it is Faithe who steals every scene she’s in. To describe her as adorable is an understatement and her need to hug everyone elicits an audible sigh from the audience whenever she says a word.